Your home needs care and protection when the winter has bidden adieu! It is spring and therefore it is time to be active once again! Gone are the winter blues but it has not taken away the damages that it has caused to the home. Winter must surely have left your home looking worn out and ugly. Weather beaten as the home and the surroundings should look, you would definitely want to do a spick and span home cleaning. The exterior of your home can look as having survived a meteor hit! 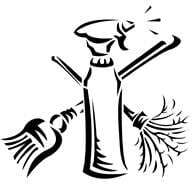 So take up all your cleaning supplies and prepare yourself for the early spring cleaning. First, clean the windows that must have gathered much dirt. The winter storm must have deposited moisture laden dirt as residue on the window glass making it look gross. The screens need to be cleaned first. Take them out and get them washed in the bath. You may use soap if required in case they have got sticky. The next task to enter the list of cleaning is clearing the gutter of leaves. The gutter must have received much of dead leaves. Remove them. Make sure to remove all the twigs and branches from the gutter too. During winter you cannot be courageous enough to do a complete home cleaning including the exteriors. So, as spring is come, it is also time to look at the garden. Sweep away all the dead leaves and trim the grass. Check if the walkways, the rails and stairs. The roof must also undergo checking for damges, cracks and on encountering one, professional help is to be sought. Posted in Cleaning Service, Home Cleaning, House Cleaning, Maid Service	| Comments Off on Your home needs care and protection when the winter has bidden adieu!